AJC ACCESS travels around the world. 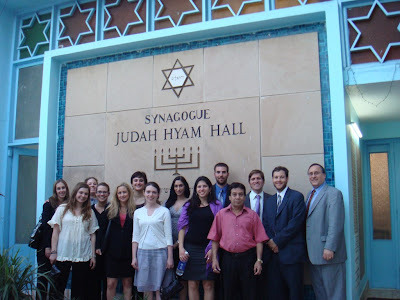 This blog will share first-hand adventures of participants engaged in advocacy and outreach on behalf of AJC and the Jewish community more generally. ...engaging today’s critical domestic and international issues. Working at the nexus between the Jewish community and the world, ACCESS reaches out to diplomats, policy makers and young leaders of diverse religious and ethnic communities. The elfin man greeted us with a huge grin from cheek to cheek. Ezekiel Malakar was the man of the night, and the pride he had for his community was palpable from our first steps onto the grounds of Judah Hayeem, Delhi’s only active synagogue. 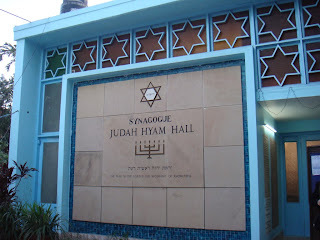 With an exterior of bright baby blue, the synagogue matched the cheery disposition and charm of our host who we learned plays the part of unofficial Rabbi, Cantor, synagogue leader, shochet, and moyel all in one. We first visited the Jewish cemetery attached to the synagogue, where a Hindu family lives on the grounds to care for the site. Then we were treated to a traditional Sephardic kabbalat Shabbat, but not before several speeches and words of welcome were delivered from various members of the community. Our visit was clearly the highlight of the week. Ezekiel gushed at how excited he was to have us visit and several members of the community stood up to say the same. The tiny room quickly filled with locals, as well as foreigners—passers-by, those in government posts, and us. At the end of the service as we shared in a local song, one could undeniably feel how connected and proud this small community feels. And then shabbat dinner! The whole community stayed for the meal—highlights included being treated to homemade challah from a representative from the Swiss Embassy, and a musical drum interlude from Ezekiel’s son. And my dinner experience also included a conversation with a retired, highly decorated general of the Indian army—a remarkable posting for an Indian Jew! Altogether, it was a Shabbat I will not easily forget—just like Ezekiel’s contagious smile.